Lycus will be bringing their crushing funeral doom to the East Coast next month! The group will play shows in California and the southwest before heading to the East Coast. This latest run of tour dates also includes a performance at this year’s Martyrdoom Festival in Brooklyn. If you haven’t heard Lycus’ newest album Tempest, check it out below along with the full list of dates. Oakland funeral doom legion, LYCUS, is in the final stages of locking down the second US tour in support of their mammoth 2013-released debut LP, Tempest. Following a maelstrom of critical acclaim for their cavernous creative delivery of soul-searing funeral doom on the three-song, over forty-minute Tempest, LYCUS toured the West Coast last Summer. Now the band is prepared to cross the continent to infiltrate the opposite coast and back on their way to take part in the five-day Brooklyn-based extreme metal event, Martyrdoom. The final venues on this long-haul for the band are being confirmed now, with a solid three-week venture planned, surrounding the band’s performance at the final day of Martyrdoom 2014 on July 1st alongside Vilkacis, Evoken and Lord Mantis, with 20 Buck Spin labelmates Mournful Congregation headlining. Recorded and mixed at hometown Earhammer Studios with Greg Wilkinson (Brainoil, Pallbearer, Samothrace, High On Fire), LYCUS seemingly adds new vitality to the funeral doom genre with Tempest. 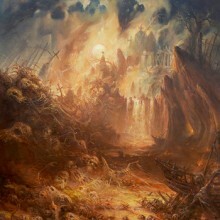 While references to Mournful Congregation, Ahab, Thergothon and Noothgrush are foreseeable, the band delivers both caustic and clean riffs and interjects multiple vocal styles and additional instrumentation which elevate the material on Tempest to their own place among the scene’s veterans and forerunners, and the album even claiming the #18 spot in Decibel Magazine’s top 40 albums of the year. Stream and purchase Tempest digitally HERE and order the CD and LP versions of the beast HERE. MARTYRDOOM Festival Lineup Announced – Mournful Congregation, One Tail One Head, Cult of Fire, & More!